Where shall I begin? I am heartbroken for the lives lost and forever shattered by the bombings on April 15, 2013 at the 117th running of the Boston Marathon. I was several blocks away in the post-finish line area when I heard what sounded like cannon fire, followed by emergency vehicles speeding toward the finish. Information began flowing by word of mouth that there were explosions, but there were no details and an eerie sense of calm and quiet as we went through the motions of retrieving belongings and meeting up with family and friends. The rest is a blur...a steady stream of sirens, tear stained faces, people standing at windows of restaurants looking in at the news reports on TV, and the long stiff walk back to the hotel. All the while, my cell phone was lighting up with calls and messages but it was all I could do to put one sore leg in front of the other and keep walking. I made a few calls, returned some texts, and posted a message on Facebook. I deeply appreciated each expression of love and concern. I read every communication but was unable to find the words to respond. Despite having been there, I know no more than anyone else. I have no answers and no explanations. We want to know who would do such a thing, and why? But there is no "why" that can patch up the irreversible damage that has been done. No "why" that can justify the lost lives, limbs, loved ones. I grieve for the victims. This race was the culmination of a dream for me that began over 3-1/2 years ago at my first marathon. I had the typical worries of injury, illness, or life again keeping me from running this race (again). I often say worry is a waste because usually whatever will happen is something we never even thought to worry about. Certainly bombs were not on my list of worries...or anyones. I was fortunate to complete the race and walk away sore but unharmed. 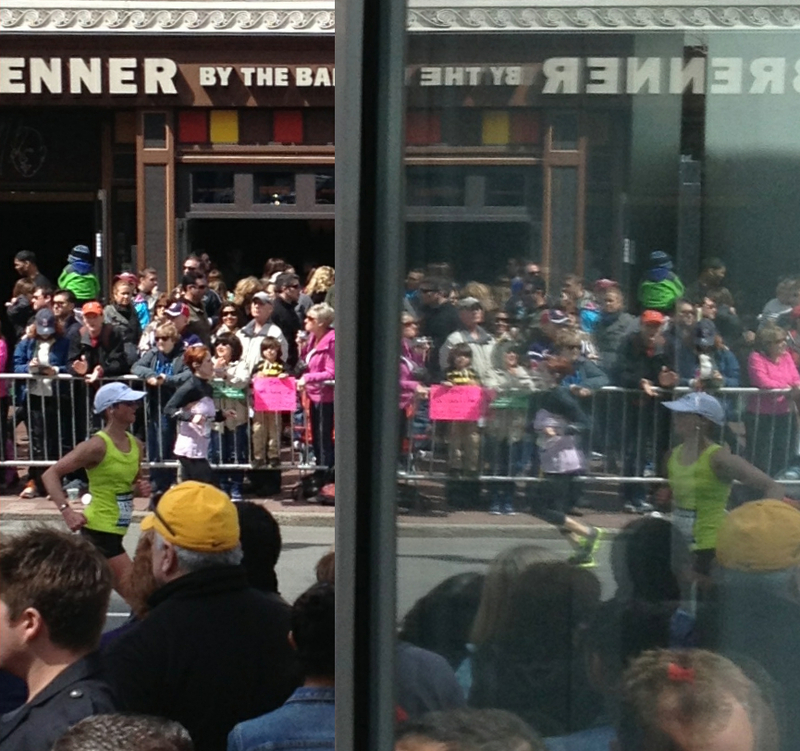 About 25% of the runners never had the opportunity to cross that famous finish line. It became the scene of triage, heroism, and loss -- where three people lost their lives, 13 lost limbs, and over 170 were injured. Nothing will change that. There's no sense going through the "what ifs". All I can do is use this reminder of vulnerability to strengthen my resolve to start each day with a smile, to love others, to stay positive, to have courage. As awkward as it is, I'm going ahead with a race report. This is not in disregard of the horrible senseless violence, but in defiance of the perpetrator who seeks to disrupt. 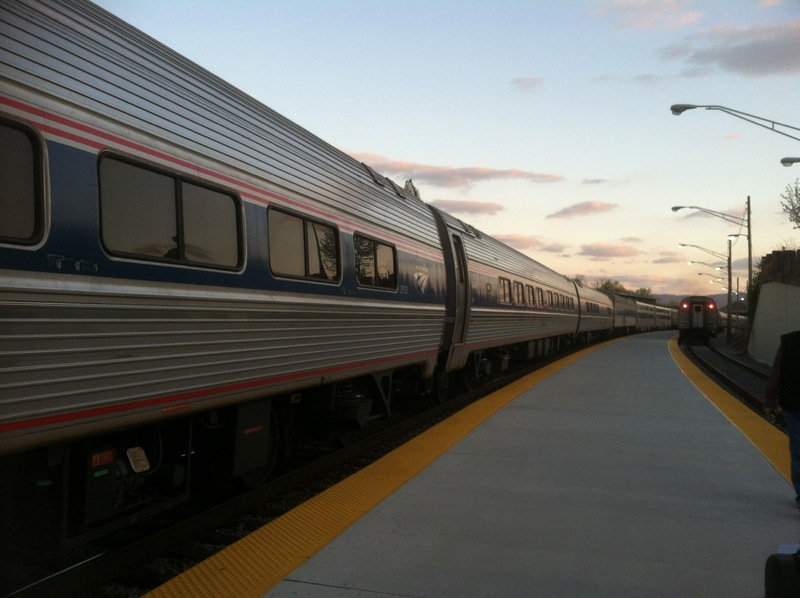 I took the train from Lynchburg, VA to Boston, which is my favorite way to travel. The drive + train + layover in NY was about 16 hours combined. I love watching the world go by and feeling the motion of the train car. The next morning (Sunday) I took the jam-packed MTA to the gigantic Expo. 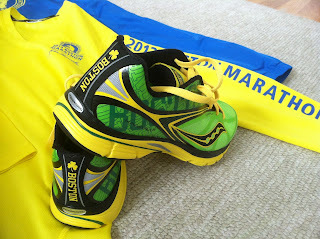 I got my bib number and splurged to buy the official Boston Marathon jacket and limited edition Boston Kinvaras. Now I am extra glad I did. Did I mention the Expo was gigantic??? I got through half and was blown away only to discover there was an entire other half! I felt really calm all weekend. I knew I was trained, ready, and healthy, and as a triathlete doing a marathon, I felt no real pressure. 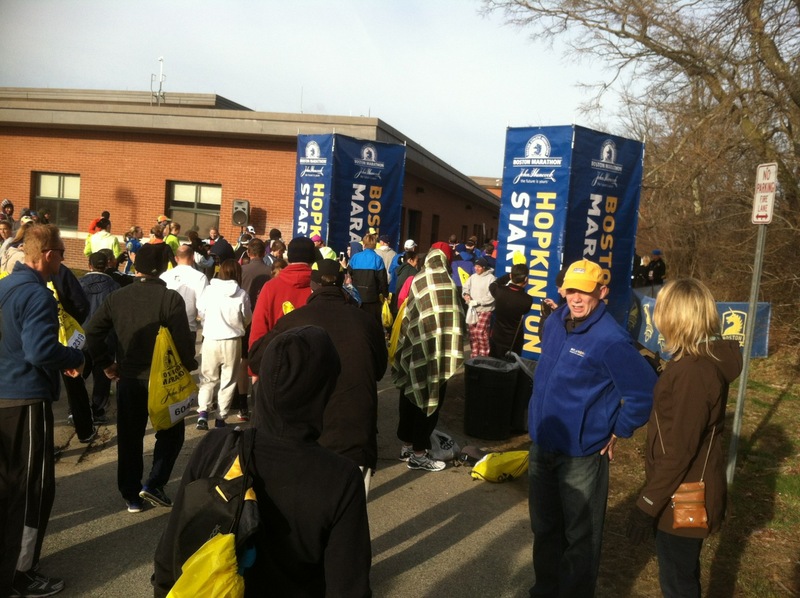 A marathon is a long time to be out there so getting keyed up does no good. Monday morning I left the hotel to walk to the buses but was invited to share a cab with fellow runner, April. It was a quick trip, a brief wait for a bus, and off we went! 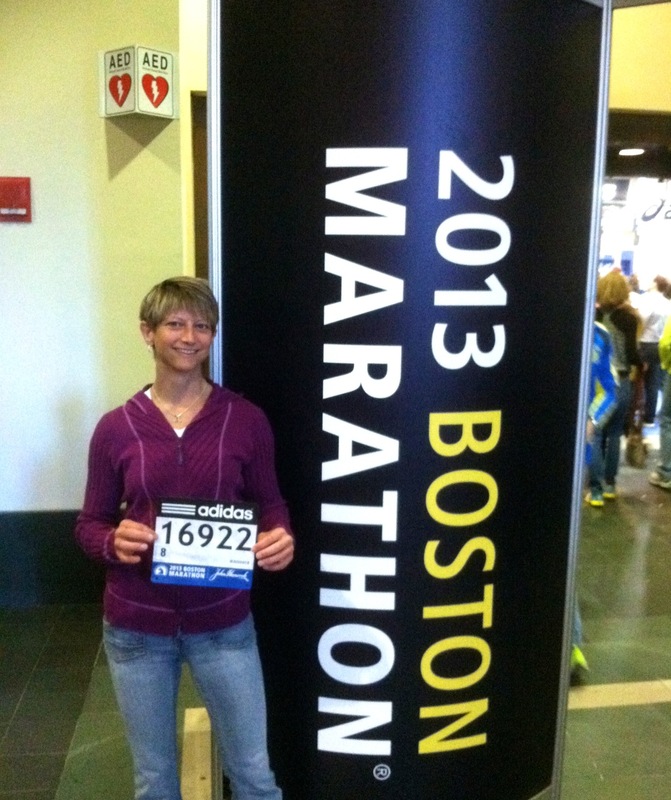 April is a mom of 3 and a sub-3 hour marathoner!! The ride seemed long and it was hard to believe we'd be running the whole way back. 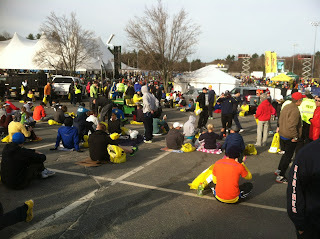 We arrived at the "marathoners settlement camp" (as I called it) before 8 am so we had 2+ hours to wait. One little detail the organizers don't make clear is that although we are staged at a school, unless you are an elite, you don't actually get to go INTO the school. The runners wait OUTSIDE the whole time. I was thankful I had lots of layers, a winter coat, hat, and gloves. 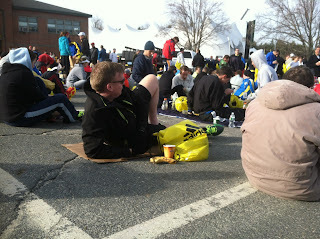 I saw shivering runners in shorts and light top layers. Newbies scavenged for cardboard to sit on while the experienced folks had yoga mats, pillows, blankets, cots, and chairs! You are given a pretty big bag to check so you can pack a lot of stuff for the wait. 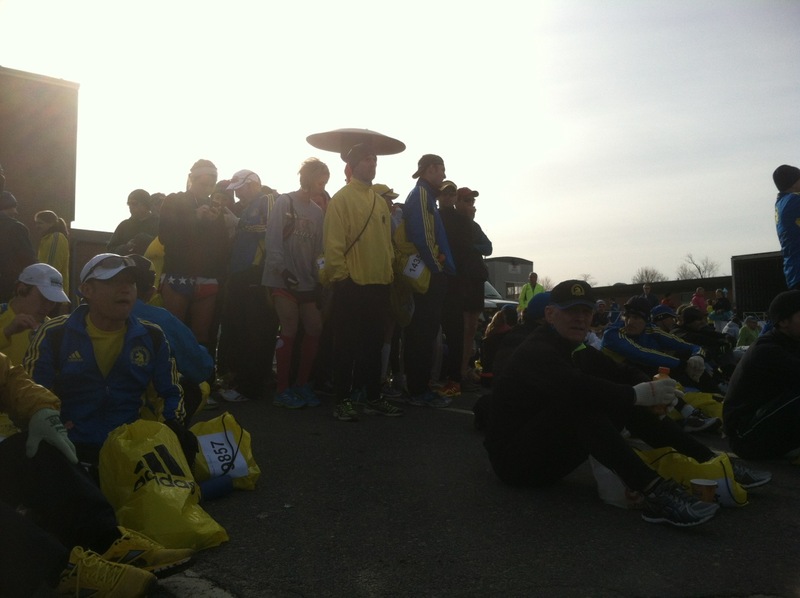 During this time, I enjoyed meeting and hearing the stories of other runners. like moths to a flame...runners to a heater! 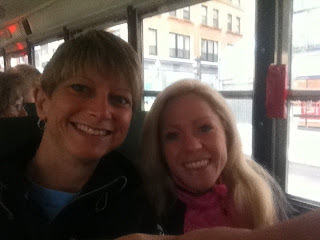 with Endurance Films Racing Teammate Laura! Soon it was time for a final pit-stop and bag check. I loaded my pockets with five gels, a peanut butter and jelly sandwich, and a cloth handkerchief of sorts (glad I took that to wipe my face and hands) then it was off on the .7 mile walk to the start. I'd been warned to leave early for the starting coral because the narrow neighborhood road gets pretty congested. Still, I found myself running for the start with some others and having less than a minute to wait before our group set off. In a moment of stillness, I looked up to see a building labeled "Hopkinton" and fought back the tears. I had finally, finally made it. It was a bumpy road to the start, but oh so sweet to be there! I shed my final layers in anticipation of a mid-50's day. 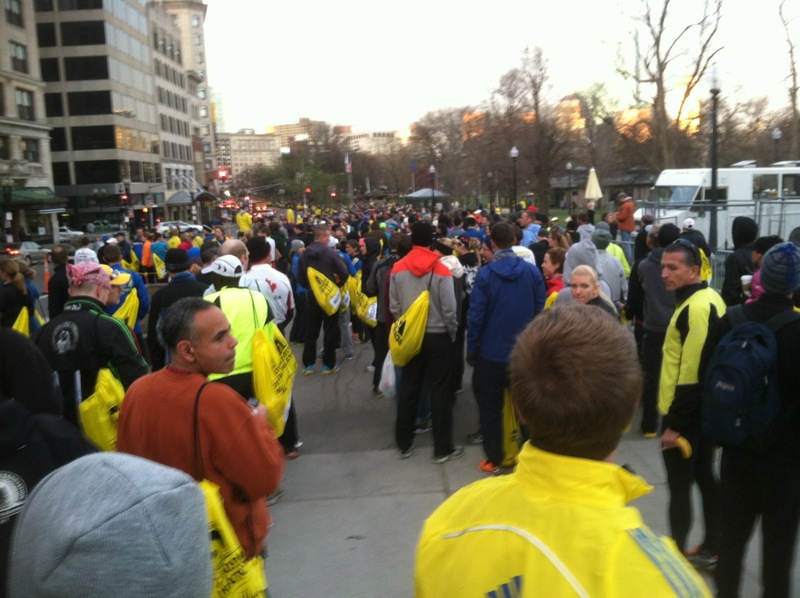 What was amazing is that the race course started pretty congested and stayed that way until the final mile or two. It was a sea of people and the sound of so many footfalls was unique. With the seeding, the crowding was not too bad, but you do spend considerable mental energy picking your way around and through people. At the frequent aid stations you had to be prepared to move to the middle of the road if you were not partaking, or drift to the side to grab a cup. I drank at every other aid station and stuck to water mainly because I'm a sloppy drinker. I saw one guy who tucked a half straw into his watchband and used that to sip from the cup. Cool idea! The people watching was fun - a Dorothy from Oz costume, kilts, some odd running styles, the barefoot runners, and the Army guys running with full packs. I was comfortable in a tank and shorts and was amazed at the number of people dressed in tights and long sleeves and multiple layers. (They must have been from Florida.) The course was lined with spectators for the full 26 miles but I think my favorite group would be the two dozen mini trampolines with bouncing kids. About halfway through I felt fatigue kicking in but remained intent on maintaining pace. 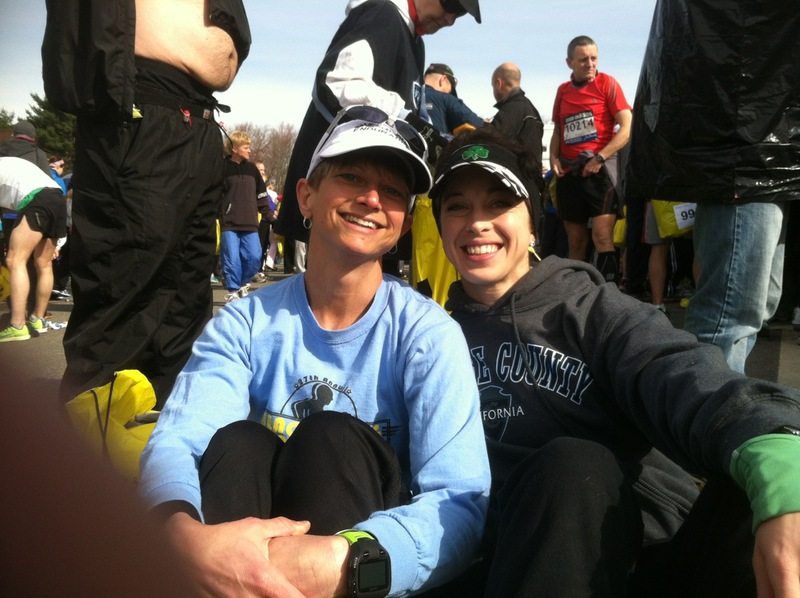 The "hills" were no problem for this Appalachian runner. As I climbed the famous Heartbreak Hill, I wasn't really sure if that was the famous hill! 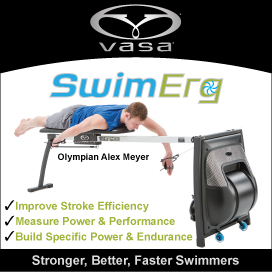 I felt my focus become sharper the deeper into the race I went. Coach Jim pointed out my heart rate for the final 5+ miles averaged 169 bpm which is close to redline for me. About four miles from the finish I felt my toes begin to cramp and I could feel it working its way up. I tried to stay relaxed but noticed as my legs kicked back, they were drawing up in a not-normal way. I just hoped the legs would hold up. I was passing more and more athletes who had slowed to a walk. I would not entertain that option. The last two miles were very tough. The cheering crowds helped carry me but by now my calves, quads, and hamstrings were cramping and I was on the brink. I crossed the finish line, pulled up, bent over, and my legs collapsed under me. That earned me a nice little rolling detour to the med tent for some massage and fluids then it was up and out and off to bag claim. I finished in 3:33:53, which was a full five minutes faster than my last marathon and a PR by four minutes. Coach Jim nailed it -- I ran precisely at his predicted 8:10 pace and that was everything I had on the day. I am proud that I ran to my potential, ran smart, dug deep, and stayed strong. I was #163 out of 1507 in my age group who started; only 1060 finished almost certainly because of the shut down of the finish area. I do not have the official race photos and the photo company posted that Homeland Security will be determining when they can be released. Understandable. It's hard enough to come down off of a big event like this under normal circumstances. I don't even quite know how to wrap up this report. This race was the culmination of the love and support of so many people over many years - my husband, children, parents, mother-in-law, sister and extended family; good friends Krista and Bryan; teammates from One-on-One Endurance and Endurance Films Racing Team; the "bodyworkers" Dr. Tilley, Mike Casciere, Mario Travis, Chris Pohowsky, John Thacker, Beth Ashe, Dr. Lebolt; fellow runners including Shannon, Michaela, and Carla; the crew at Runabout Sports; trainers Jake Parks and Kurt Weidner; John Jones, John Murray, Mark Sortino, Eric Neilsen. It's always a risk to name names because you never get them all. Suffice it to say that I am humbly grateful to be a part of the caring and earnest community of runners and triathletes who span the globe. This is a community that will not be deterred by threats of violence. Peace and love to all. Prayers for those who are suffering.